SayWhatNews: Good morning Terry, thanks again for taking the time and speaking with SayWhatNews -your online entertainment magazine. Its truly an honor to be speaking with you. Tell us who is Terry Dexter? Terry: I am a fairly simple mid-west woman that doesn’t judge, keeps everything as positive as I can and my priorities are god, family and friends. I love life and experiencing the amazing journey that comes with it. SayWhatNews: Tell us what was it like growing up in Detroit Michigan the home of Motown. Terry: Detroit is what I like to refer to as the “Core of America”. We are the motor city and represent hard working, dedicated and loving people . I have a big extended family and that is what most native Detroiters have around them: a lot of family, love and support. We are a city with so much history, of course Motown and its legacy is still woven in each of us. My father and uncles grew up and knew or have come in contact with many of the Motown Greats so I grew up listening to a lot of the music. Lets just say “I got stories”. SayWhatNews: I bet you do. Did growing up around Motown’s legacy have any influence on you wanting to be a singer and songwriter? Terry: Oh Yes, for sure. Because of Motown and the artists that came from it the “bar” was a lot higher growing up and singing there. I remember as a child and performing around the city and in church there were SO!!! many amazing singers around me you just couldn’t help but want to sing and perform. I heard the music everywhere from my parents house, other family members houses, friends and etc. Motown music and its sound was definitely in the air and very much inspired my career. SayWhatNews: Terry at a young age to began singing in your Uncle’s church. What’s one of your most memorable moments performing there? Terry: Actually it was my very first performance in church ever.. I was about 7 yrs old and I performed “Amazing Grace” and I remember while singing looking at the adults cry but I couldn’t understand why. Then I found my mom and dad in the audience and they were crying and then I understood it all completely. That was most memorable indeed. SayWhatNews: During your early teen years you began singing with the band Tri-Star. How did that come to be? Terry: I actually started in Tri Star at the age of 9 till about the age of 13. I performed in my first talent show in our neighborhood. The boys in Tri-Star who were a separate group at the time also performed and we both tied for first place. Afterwards our moms got together and formed the group and we started to rehearse a few days later. All the boys from the group are doing very well.. Chris Henderson from Tri Star is now a successful producer. He actually wrote and produced the recent hit “Blame It On The Alcohol” for Jamie Foxx. SayWhatNews: A hit indeed, that song was one of this past summer’s biggest hits. Also during your teen years you began singing background for artists such as Simply Red. How did you get the chance to work with such talents at a young age? SayWhatNews: Terry, in 1999 you released your self-titled album with Warner Brothers which had two singles “Better Than Me” and “Strayed Away” to land on the Billboard Singles Chart. What an accomplishment to achieve with your first album. Tell us how you felt when you learned two of your songs had made it on the Billboard Charts. Terry: That was such an honor and so exciting. I think what was more exciting was during my first album experience I lived in New York City (which I consider my second home).. Both of my singles hit number one in NY back to back. I got the honor to guest DJ on the station WBLS in New York at the time and the surprise was being able to announce that the number one record was mine. SayWhatNews: Now that’s a true special moment. And with that, your music career kept moving forward with great success. You then joined Eric Benet to remix his hit single “Spend My Life”. Now I remember when the remix debuted on TV and my first thoughts were that’s not Tamia but when you began to sing I was just so taking back with your voice that I immediately became a fan. So tell us how you ended up working with Eric Benet. Terry: Thank You. Eric and I were label mates on Warner Bros. and during the recording of my album and his second album he was like a big brother( the entire label was very close like family during those days) Tamia, I think was pregnant and couldn’t perform with him so the invitation was extended to me to do TV dates and some shows with him.. Then the requests started to come in specifically for me to perform and from that buzz the remix was born. We actually recorded it in New Orleans a few hours before hitting the stage at the “Essence Festival”. SayWhatNews: The remix version of “Spend My Life” is still a fan choice today. How does it feel knowing you helped take the song to the next level? Terry: Actually, I helped take it to number one. It is a great song and a nice twist to the original. Definitely a big highlight in my career. SayWhatNews: Yes it is a nice twist and one of the best remixes out there. Terry, you teamed up with Eric Benet again on his new album “Love & Life” on the single “Everlove” which made fans very happy because having the two of you on the same track is pure magic. Now tell us did Eric pick up the phone and call you and request you do a guest appearance on his new album? Terry: That’s exactly what happen.. lol.. He called me and said I’m sending you a song I want you to sing with me on. Session is tomorrow be there!! lol.. With Eric you know that whatever he presents is amazing.. He is a great songwriter and singer and always a pleasure to work with..
SayWhatNews: Eric sure is. I’m a huge fan of his as well. Speaking of guest appearances, Terry you have worked with some of the best. You did a guest appearance on Jaheim’s album and even worked with The Black Eyed Peas Will. I. AM on his song “Lay Me Down”. Is there anyone you would love to work with in the future and why? Terry: I would looove to work with Whitney Houston and Bette Midler. They are both my idols. Whitney was my childhood idol and I just adore her voice and gift. She was greatness then and still now and will always be.. Bette Midler because she is such an amazing all around performer who just does it all.. singer, actress, dancer, comedian, writer.. A “Super Threat” which is rare.. She is very inspiring..
SayWhatNews: Woo, if I could only be a fly on the wall that day in the studio. You with either Whitney or Bette would be magic. Now, in 2003, you made your film debut in the movie “Deliver Us From Eva” starring LL Cool J and Gabrielle Union. How did this opportunity present its self? Terry: I was signed to A&M at the time and met the director through Alison Ball who handled the music for the movie. She recommended me to the director and when he found out I was from Detroit like him it was a done deal. SayWhatNews: Tell us what was it like working with LL Cool J and Gabrielle Union? Terry: LL Cool J, I already knew from the music biz. He is such a great guy and funny and Gabrielle is a sweetheart and very real.. The whole cast was so much fun to work with. SayWhatNews: Did you always want to become an actress all long with being a successful singer/song writer? Terry: No, actually acting was something I shied away from for a long time. I started acting about two years ago and now I just love all three crafts. SayWhatNews: In David E. Talbert’s play “Love In The Nick Of Tyme” you played the lead role. Now this was your first role being the lead character, so how nervous were you and what did you do to prepare for the role? Terry: I was terrified, lol.. David believed in me when I wasn’t sure I could do it. To bring Tyme to life I just connected to the channels that I used to express my music. Those channels are to be open, raw, and real.. To simply: “Give yourself permission to be”. SayWhatNews: Just you saying that is very moving and makes me want to see the play. In between making albums your music has been featured on some movie soundtracks like Rush Hour, Bait, Deck the Halls, Bring It On 2, Legally Blonde and most recently you had two songs on the soundtrack of Not Easily Broken which starred Taraji P. Henson and Morris Chestnut. How amazing it having your music featured in/on a major film/soundtrack? Terry: So much fun with a lot less pressure.. It’s a more behind the scenes process and you are part of a large team instead of being the main focus. I love to see the movie and experience how something I was part of creating music wise helps bring to life a scene and story. SayWhatNews: The great Patti LaBelle is your mentor. How did Patti LaBelle become your mentor? Terry: I met Patti through the great songwriter /producer and dear friend of mine, Sami Mckinney. I met her at age 14 on the phone through Sami during a studio session and from that day on she has been a rock in my career and such an inspiration to me.. Or as I call her Motheeeeer. SayWhatNews: Terry you even had the honor to perform on the same stage with Patti Labelle on the Tonight Show. What was it like performing with such a musical legend? SayWhatNews: Terry you are so talented that you are able to cross over music genres and sing and write. You just recently co-wrote a gospel song for Patti LaBelle’s upcoming album, in addition to having two songs land on Billboards Dance Chart. Is there any genre of music that you prefer or would love to do a full album with? SayWhatNews: Us Terry Dexter fans look forward to that. Speaking of albums, how did you team up with the independent record label Penny’s Gang Records to work on your 3rd album “Listen”? Terry: I had the idea for “Listen” for a long time in my mind but many industry people were scared to embrace it… I met Chris Bolden through a friend who at the time headed the label.. I told him about my vision and he and Penny MCcoy the owner of the label invited me aboard.. The label is amazing and very supportive. I am so blessed to be able to have created something so special to me with such a great group of people and to see my vision come to light. There is no greater fulfillment..
SayWhatNews: Terry your new album “Listen” includes several inspiring songs. Why did you want to release a album to uplift, inspire and encourage people who are struggling with maintaining their faith? Terry: I love people and this album was inspired by the stories and struggles I’ve heard over the years from friends, family and even strangers. I found that it is hard to get through to certain people who are dealing with challenges. There is a certain wall and or distance that they carry and a hand or shoulder to lean on has to come from a very warm and gentle yet powerful place. Music has the ability to absorb into us the way words cannot and it is through “Listen” that I hope the message of hope and love would some through. SayWhatNews: Tell us what inspired the song “Beautiful One” which you co-wrote with then very talented Rashaan Patterson and Jamey Jazz. Terry: “Beautiful One” is the first song we wrote for the album. It was inspired by children actually. It is ultimately a message for all people that they are “beautiful” no matter what they see or think. SayWhatNews: Your single “I’m Free” is one of those songs you can relate too. The single’s video was a hit on You Tube the first week it was posted. What inspired that song and what did you want your fans to get from it? Terry: “I’m Free” was inspired by my own experience. I was so caught in the “concrete” as I call it, of life and forgetting my priorities and just getting lost and caught up. I had a tough realization which brought me to my knees at one point and it was through my faith that I turned it all around and got back on track. I believe we all go through this at some point in our lives and can all turn it around in a positive way. 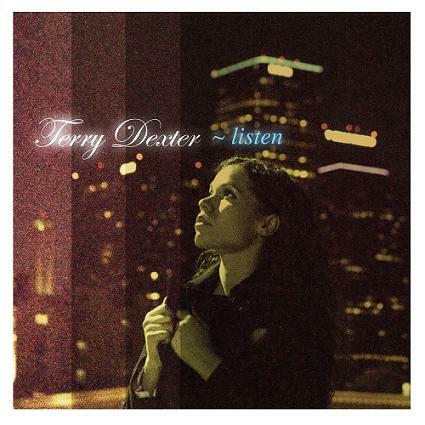 SayWhatNews: What’s next for Terry Dexter? Terry: We are re-launching “Listen” this coming January with the single “Sister” which I am excited about.. I am looking into doing another R&B album as well right now. (in the negotiating process) so we’ll see.. I’m doing a couple dance projects as well with Roy Davis Jr. and some overseas teams. Also “The Love In The Nick Of Tyme” DVD in HD is coming out Nov 3 which is great..